Any reliable SD-GT's out there? Went for a ride around west Marin today, had the MTC fault out again. The check engine light stayed on—again—although I was able to reset the MTC and return home without a repeat. This suggests to me that the exhaust valve is once again the culprit. I've armed myself with your observations on previous posts here, and will return to the dealer to see what they can do. Last time (last week) they plugged into the ECU to identify and then reset the error code, which they identified as coming from the exhaust valve. I've watched the exhaust valve to verify that it is moving when the ignition is switched on. Problem is, the fault has always occurred during a ride, out of nowhere, never on initial startup. I've had this bike just over a week, and wasn't planning a link pipe install, or exhaust valve removal, right away. I'm wondering if the kind of bypass that DaveNZ describes can be done with the stock exhaust and cat intact. Any ideas? JF, i got a link pipe from Remus, and it came with a cam that replaces the valve cables, and the valve cable cam, at a later date you could get the Remus link pipe and a muffler to suit, but for now and under warrantee, get the bike shop to sort it, it could be a sticking exhaust valve, or the electric mechanism that turns the cam opening and closing the valve. Let them sort it, the do your add ons when you need them. my 2cents anyway. Thanks, Dave. I'll take it in this afternoon or tomorrow and see what they can do. I've copied the relevant parts of these posts on my phone, maybe they'll provide the service guys with some guidance. jfwaller wrote: Thanks, Dave. I'll take it in this afternoon or tomorrow and see what they can do. I've copied the relevant parts of these posts on my phone, maybe they'll provide the service guys with some guidance. I hope they get it sorted out for you. Be careful riding the bike until you get the MTC problem fixed because when the MTC fails the bike is designed to go into what my dealer calls "limp mode" and only allow limited power to the back wheel. This by itself would not be a disaster but my bike had an intermittent MTC failure and before it failed completely and would cut ALL power momentarily before going into limp mode each time it happened. If this occurred right on the apex of a corner it could significantly throw you off line which might not be good. Okay just did a 1,400 mile ride so now have 2,200 miles on her and so far no issues whatsoever !! Not had any problem (only 6,000kms ) but, was wondering......on the Caponord1200 forum everyone was talking about a Healtech exhaust valve elimunator plug-in device. Not seen any mention in this forum. If such a device was made for the 1290, might remove a potential weak spot. My exhaust valve motor controller eventually failed on that Capo1200 and was replaced under warranty at 30,000kms, but the thing was still easily ride-able with the exhaust valve stuck fully open...... sounded great too (not too loud - just more menacing). I wonder if the 1290 would work as well with the electronics tricked into thinking the exhaust valve was still working, after being disconnected? Thats what many of us are waiting for Dave, an electronic plug in solution, so the entire valve- cables an motor can be removed. my valve and cables have gone, but the motor (actuator i think its called) is still operational, but it has a sneaky little cam inside that fools the ECU into thinking the valve is still there and working as it should. A valve in an exhaust after time must get stiffer and eventually fail, putting strain on the actuator motor. I'm hoping with my sneaky cam, and no valve, the actuator motor gets an easy life, and lasts much longer. long enough for an electronic dongle to come out to replace the whole stupid system. Unlike my mates new Multistrada....had to cancel meeting up with us, big pool of oil next to his bike that should have been inside the fork leg! So I have to be happy just looking at my GT as I shuffle about recovering at home (now) and waiting for my chest bones to knit (not permitted to drive car either for 2 months or so). Last edited by Aussie Dave on Mon Apr 09, 2018 10:58 am, edited 1 time in total. So I have to be happy just looking at my GT as I shuffle about recovering at home (now) and waiting for my chest bones to knit (not permitted to drive car either for 2 moths or so). Glad to hear they caught the problem before....well, before it got worse! Best of luck on your recovery. I’ve had my GT for nearly 2 years now and have had various recalls done such as; fuel line, front brake MC, wear pad on swing arm etc. On a trip to Spain in 2017 the clutch slave cylinder failed and the bite point moved progressively back to the bar. This was replaced under warranty. I have just come back from another trip to Spain and the clutch slave is starting to go again. I am going to invest in an Oberon replacement. The headlamp flasher switch also broke and the whole LH switch assembly was replaced under warranty along with the oil filler neck which had corroded. I have the KTM panniers which are crap with gaps showing. Recently rode a 2016 1200 Pikes Peak and a 1260 Multistrada both felt too soft and slow compared to the GT so will be keeping for the time being. I have to say, I have had my 2016 sdgt for a year now, and I have 4500 miles on the clock now. I love this bike! I had the MC recall and fuel line done under recall. The left side front fork seal took 3000 miles to seat properly. I have a racefoxx link pipe and pipewerx can, (the sound is mental) I may put the catbox back on once my neighbors start complaining. I also have a Puig windscreen, the stocker cracked when I tried to adjust it. The panniers do have gaps, but I run them anyway. All in all, this bike is pricey to maintain. But, and this is a huuuuge but, it has to be the best all around motorcycle I have ever ridden! The power is insane for a sport touring bike! The midrange torque is immense and I always have a smile on my face when I twist the throttle. The M50 brembos exceed my expectation and it handles like a dream. I'm in New York, United States. 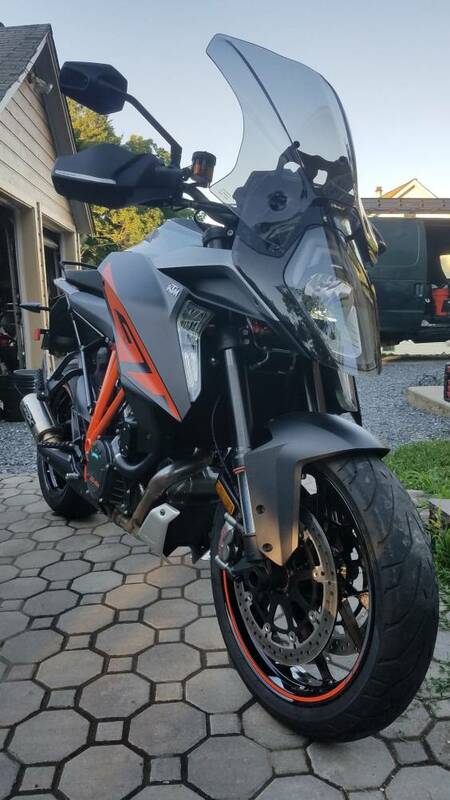 I have not seen another Super Duke around my area. I met some one with a Ducati Diavel and we switched for about 100 miles, and he didn't want to give me my bike back! 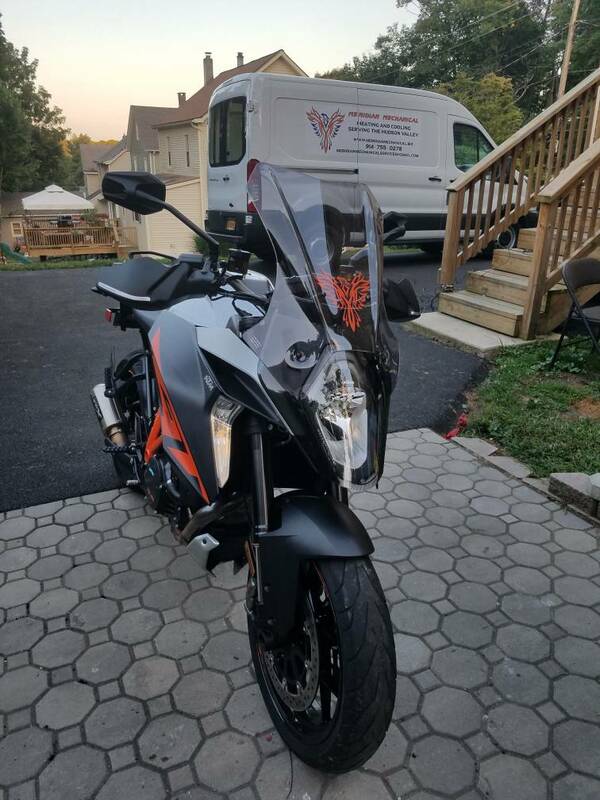 All in all, cruise control, semi active suspension, heated grips, and over all great performance, this bike is worth the coin if you have it! Oh. The pirelli angel gt are a great tire, but at high speeds I notice a little shake... not sure if its tires. ^^ Put some PR5s on next, they are a great tire. I'm on my 5th set of tires on my GT, Stock Angel GTs, Metz M7RRs, 2 sets of Roadtec O1s, now my first set of PR5s, and i like these best as of their alround performance and hopefully long gevity. Cabin fever must be getting to me........ I hate the title of this thread........ it screams out loudly that KTM's have some reliability issues when in fact they are no worse (if at all) than other revered brands (eg BMW/Ducatyy/Aprilia/Mguzzi/Triumph......hell even the Japs have lost their title for reliability with 'just in time' contractors substituting parts without manufacturer's approval....... shhh, that came from my insider - so don't tell anyone eh ). Wish we could re-title it so it didn't appear on Google search pages - the other thread that pisses me off is the one whinging about 2018 models not on the website........ I wonder what I was looking at (a month ago) on the showroom floor....... they looked like 2018 painted models as per the KTM Aus website....... so take care with the wording of thread titles eh......... these often appear outside this forum and can deter interested buyers from their own test ride appraisal. 2017 SDGT 6500 miles and about 11 months of ownership. Fun bike. Still not sure about the looks, but I bought it for performance, technology and features. I;m a function over form guy. - Brembo M/C and fuel line recall performed. When I brought it in for 600 mile service, the dealer quarantined the bike and wouldn't give it back to me for nearly 3 weeks while they obtained parts, etc. - Rear turn signals filled up with water and dried dirty/muddy inside, yet the bike was only on one rainy trip and it has never seen a gravel road or driveway. I disassembled and cleaned, but upon inspection, it was obvious it would happen again, do I binned them and bought aftermarket winkers. - Low/High Beam switch has been a real pain. It's been back to the dealer twice and it's still wonky. - Both handlegrips have slop/play in them due to the floating heater design. It's only a couple millimeters movement (along two axis) but it reduces the bike's precise handling. - Quickshifter is nowhere near as smooth as other bikes. My theory is that the lean fueling causes a power return delay. - MTC failure (limp home mode) caused another week in the shop. Turns out it was the cables on the exhaust needed adjustment, Problem is, I never messed with them but because I installed an Akro slipon muffler (purchased from the KTM Powerparts catalog at my dealer),they charged me $375 for labor troubleshooting a "tampered exhaust". Unbelievable. I asked them to elevate my protest, but I'm not holding my breath. 3) No ECU access solutions from the aftermarket. This forces owners to rely on the sparse dealer network to reset service interval reminders and/or resolve issues while severely limiting customer access to customization such as tuning fueling, timing, quickshifter delay, throttle maps, blinker cancellation, etc. I still enjoy the bike and actually recommend it those who inquire.